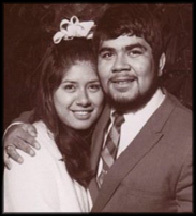 Bobby Lee Verdugo and Yoli Rios were key organizers of the East L.A. Chicano Walkouts at 5 high schools in East Los Angeles that began on March 8, 1968 and spurred an education rights movement in protest to the discrimination and oppression that confronted the Chicano community. The couple, who began dating at the time of the Walkouts, went on to get married and to devote much of their lives and energies to civil rights activism, educational reform and social progress. 2018 has proved a banner year of celebration and commemoration for the couple, who have been in high demand around the country speaking and discussing their work on the 50th anniversary of the historic Walkouts. In March 2018, they participated in a special 50th anniversary commemoration at the California State Capitol. As a sign of his continuing commitment to the cause, in July 2018 Bobby Verdugo was named Volunteer of the Year by the Chicano/Latino Youth Leadership Project of California, with which he has been involved for over a decade. 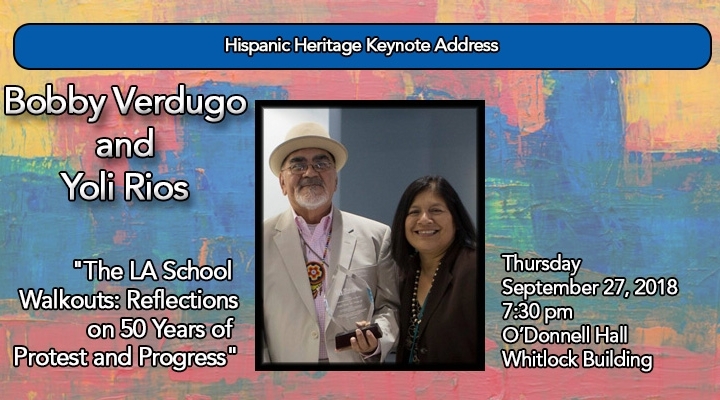 Hailing from Lincoln Heights, California, Verdugo and Rios grew up in East Los Angeles in the 1960’s, a time period where Latinos and Chicanos were not encouraged to continue their education and were often discriminated against. The two were leaders of the historic 1968 high school walkouts of East Los Angeles, a student-led effort to bring education reform to the disenfranchised schools on the Eastside. In addition to educational and policy improvements, the walkouts brought about a remarkable increase in Chicano enrollment at UCLA, from only 40 students in 1967, to 1,200 students in 1969. Verdugo and Rios were portrayed in the HBO docudrama, Walkout, about these events. Verdugo is also featured in the critically acclaimed PBS documentary, CHICANO –The History of the Mexican American Civil Rights Movement. Mr. Verdugo is Senior Education/La Educación Specialist with the National Compadres Network, where he encourages and supports the positive involvement of Latino males as fathers, sons, grandfathers, brothers, compadres, partners, and mentors in their families and community. After 1968, he continued to advocate on behalf of the Latino community nationwide. 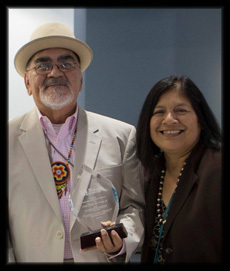 He has also served as a National Advisory Board Member for the Johns Hopkins University Native American Fatherhood Project, as President of the Board of Directors of the National Practitioners Network for Fathers and Families, as a Member of the US Office of Child Support Enforcement’s National Hispanic/Latino Forum and as a Board Member of the Center for Family Policy and Practice. Often traveling to Kentucky, Bobby Verdugo mentors and inspires students in the Latino Leadership and College Experience Camp, a camp sponsored with a partnership between Bluegrass Community and Technical College and EKU that helps young Latino high school students transition to college and learn about the diversity of Latino heritage. Mr. Verdugo encourages students to continue their education and advocacy by sharing the message that the work of his generation lives on in them. Recently, the EKU Department of Languages, Cultures and Humanities opened the Bobby Verdugo Bilingual Peer Mentoring and Tutoring Center in McCreary Hall in honor of Bobby Verdugo’s work and influence. Bobby Verdugo and Yoli Rios are the proud parents of two daughters, Monica and Maricela. 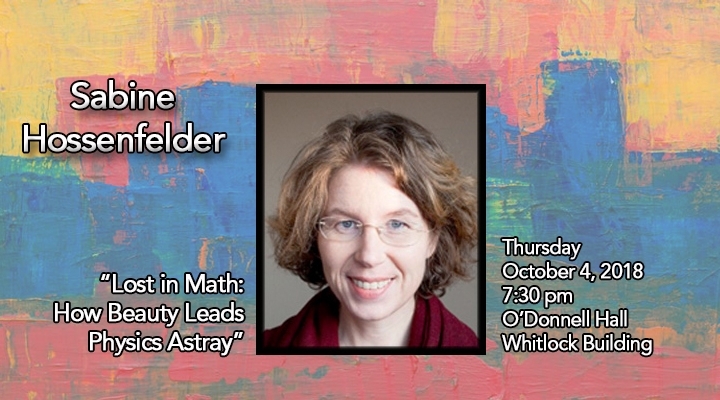 Sabine Hossenfelder is a Research Fellow at the Frankfurt Institute for Advanced Studies, a theoretical physicist, science writer, blogger and the author of Lost in Math: How Beauty Leads Physics Astray (Basic Books/Fischer, 2018). She has published more than 60 research articles on topics ranging from the physics of black holes to cosmology to the foundations of quantum mechanics. In the last decade, her research has centered on the question of where best to search for experimental evidence of quantum gravity. More broadly, her research examines on the foundations of physics and extends to the philosophy and sociology of science. Since 2006, she has actively maintained the popular science blog, Backreaction. With support from the Foundational Questions Institute, Hossenfelder has also produced several music videos in collaboration with Timo Alho and Apostolos Vasilidis. Her recent videos include “Catching Light” on the ideas of Einstein and “Schrödinger’s Cat,” which explores the famous thought experiment of the same name. After earning degrees in Mathematics and Physics, Hossenfelder completed her PhD in Theoretical Physics at the J.W. Goethe Institüt in Frankfurt, Germany in 2003, writing a dissertation on “Black Holes in Extra Large Dimensions.” She subsequently pursued post-doctoral work with fellowships at the GSI/Heavy Ion Society in Darmstadt, Germany, the University of Arizona, the University of California at Santa Barbara and Perimeter Institute at the University of Waterloo, Ontario, before taking up a professorial position at Nordita in Stockholm, Sweden. 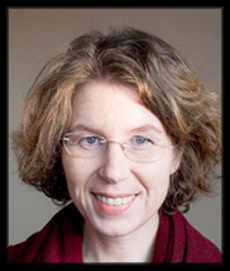 Sabine Hossenfelder regularly writes articles for a popular audience on research in physics. 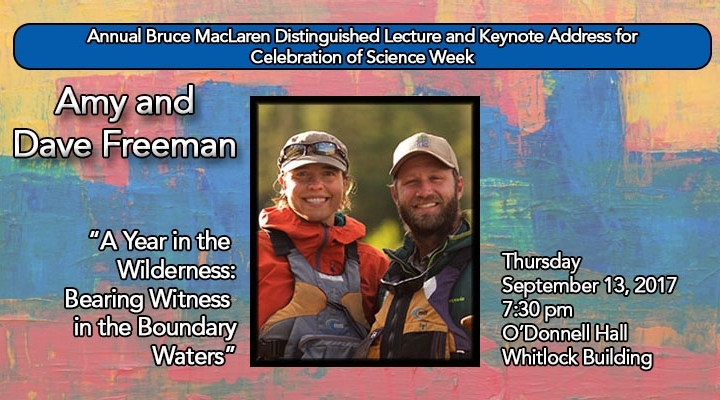 Her writing has been published in Scientific American, Spektrum der Wissenschaft, New Scientist, Quanta Magazine, Nautilus, Edge and Aeon, among other venues. Sabine is a member of the German Physical Society, the American Physical Society and the Foundational Questions Institute. 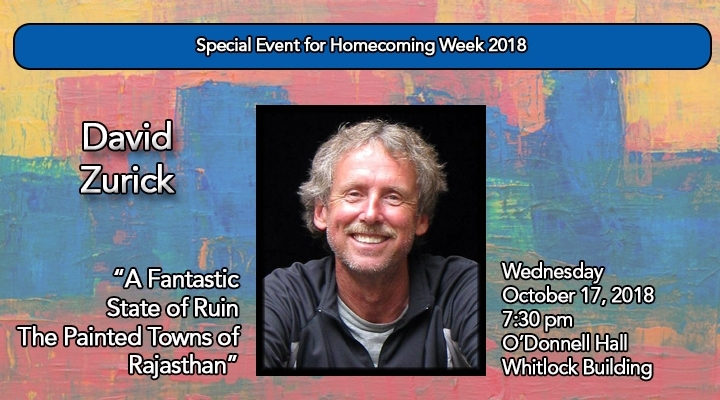 David Zurick is Foundation Professor of Geography at Eastern Kentucky University, an Adjunct Graduate Faculty Member at the University of Kentucky, a world traveler, photographer and the author of over a dozen books, including most recently the 2018 Nautilus Silver Award Winning Morning Coffee at the Goldfish Pond and A Fantastic State of Ruin: The Painted Towns of Rajasthan, which forms the basis for his Chautauqua presentation. (See book intro video here.) 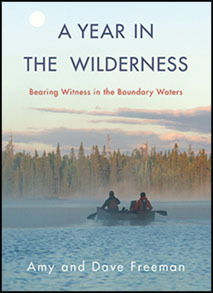 The Nautilus Awards are an annual accolade for books in the genre of social and environmental justice. Past winners include The Dalai Lama, Deepak Chopra, Barbara Kingsolver and Thich Nhat Hanh. 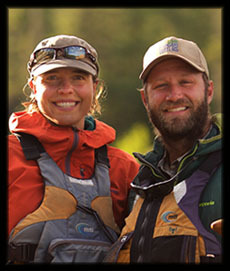 In addition to the Nautilus, Zurick’s books and photography have won numerous other awards, including the National Outdoor Book Award and Kentucky Arts Council Al Smith Visual Artist Fellowship Award (twice). In 2009 he received the “Mt Everest Award” for his lifetime achievement in Himalaya studies. 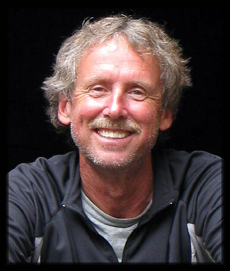 He is a Fellow of The Explorers Club, was the EKU College of Arts and Sciences Distinguished Roark Lecturer in 2011 and was a Featured Artist of the Kentucky Arts Council in 2015. In 2006, David produced the acclaimed Illustrated Atlas of the Himalaya. In 2011 his ten-year photographic study of the American South was published in the book, Southern Crossings: Where Geography and Photography Meet. And in 2014 he completed a ten-year series of photographs about sacred places in Tibet and the Himalaya, which are published in his book, Land of Pure Vision. For several years he lived in Polynesia, where he made images for his project Oceanic Coordinates: Rising Seas, Losing Paradise. In 2014 David began a series of color photographs in India called Painted Towns. David’s documentary film, Crossing Sacred Ground, was completed in 2017 and is making its way through the festival circuit. After earning his B.A and M.A, at Michigan State, Zurick went on to complete his PhD in Geography in 1986 from the University of Hawaii and the East-West Center, Honolulu, and he began teaching at EKU the following year. Dr. Zurick is set to retire after this semester, although he will continue his travels, photography, writing and research. Official Selection: Nashville Film Festival, Traverse City Film Festival, LA Film Festival, Nevada City Film Festival, Hot Springe Film Festival, Women Texas Film Festival, Southern Circuit 2018-19. 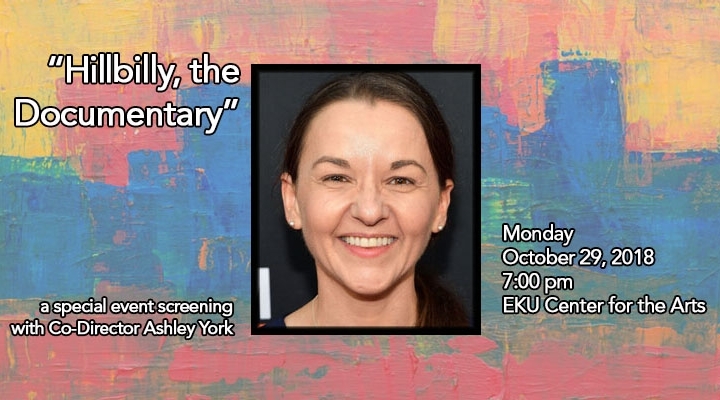 Ashley York (co-director) is a Kentucky-born mediamaker and film producer who is interested in documentaries, socially conscious media, and emerging modes of storytelling. She has worked on Academy Award® nominated teams and as a producer on projects that have premiered at the Sundance, Berlin, and SXSW film festivals as well as on Oprah Winfrey's Network, A&E, IFC, HBO, Discovery, and the Sundance Channel. She co-directed and produced Tig, an Official Selection of the 2015 Sundance Film Festival and Hot Docs Canadian International Documentary Festival. Ashley was one of nine women debuting a feature film at the 2015 Sundance Film Festival. Ashley is committed to a feminist approach and intrigued by work that intersects the emotional and ideological. She is inspired greatly by the work of bell hooks, the late Aimé J. Ellis and Susan Sontag, and Silas House. 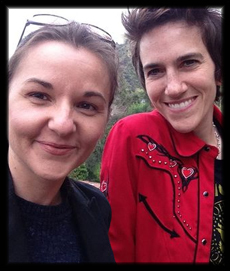 She produced two 2011 Sundance Film Festival Official selections: Becoming Chaz, about Chaz Bono's gender transition; and GRAB, about the Laguna Pueblo tribe in New Mexico. She is a member of Women in Film, the International Documentary Association, and a founding member of the Los Angeles-based design collective, Take Action Games, which has been recognized for its commitment to highlighting issues that affect women and girls and partnered with various social justice and mission-based organizations to make digital activist projects, including the United Nations Entity for Gender Equality and the Empowerment of Women, the International Crisis Group, the Independent Television Service, and the Center for Asian American Media. Take Action Games received an Emmy Award nomination in the category of New Approaches to News and Documentary Film as well as the prestigious Governors' Award from the Academy of Arts & Sciences (the Emmy's highest honor) for a campaign co-produced by mtvU to raise awareness about the ongoing genocide in the Darfur region of the Sudan. Ashley received her BA in journalism from the University of Kentucky and her MFA from the University of Southern California's School of Cinematic Arts where she currently teaches. 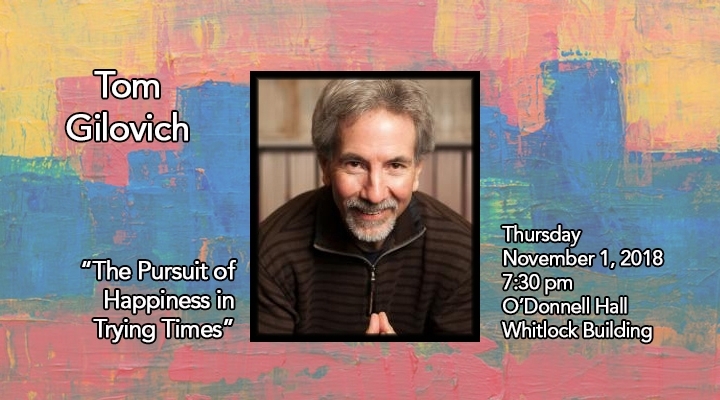 Gilovich is the author of scores of widely cited articles and several popular books, including The Wisest One in the Room: How You Can Benefit from Psychology’s Most Powerful Insights (with Lee Ross), How We Know What Isn’t So: The Fallibility of Reason in Everyday Life, Why Smart People Make Big Money Mistakes, and How to Correct Them (with Gary Belsky) and Heuristics and Biases: The Psychology of Intuitive Judgement (with Dale Griffin and Daniel Kahneman), as well as one of the standard textbooks of Social Psychology. 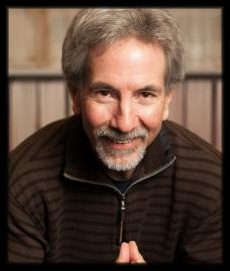 Gilovich is a recipient of the Russell Distinguished Teaching Award at Cornell, where he has taught for over 30 years. He is a member of the American Academy of Arts and Sciences and a fellow of the American Psychological Society, the American Psychological Association, the Society for Personality and Social Psychology, the Society of Experimental Social Psychology and the Committee for Skeptical Inquiry. Devon Abbot Mihesuah is the Cora Lee Beers Price Teaching Professor in International Cultural Understanding at the University of Kansas, a Member of the Choctaw Nation of Oklahoma, the creator of the American Indian Health and Diet Project, the former editor of American Indian Quarterly and the author of over a dozen books of fiction and non-fiction, including most recently Ned Christie: The Creation of an Outlaw and Cherokee Hero, as well as American Indians: Stereotypes and Realities, So You Want to Write about American Indians?, Choctaw Crime and Punishment: 1884-1907, Recovering Our Ancestors’ Gardens and Indigenous Food Sovereignty in the U.S (edited, with Elizabeth Hoover, forthcoming in 2019). 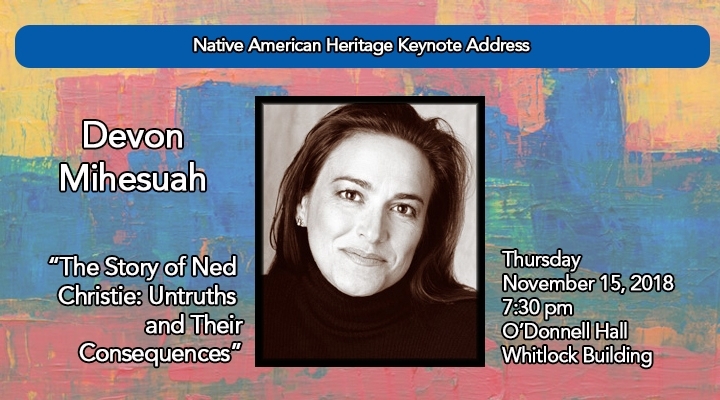 Prior to moving to the University of Kansas in 2005, Mihesuah taught for 15 years at Northern Arizona University, where she was Professor of Applied Indigenous Studies and History. After completing degrees in Education and History, Mihesuah went on to earn her PhD in American History from Texas Christian University, where her dissertation on the history of the Cherokee Female Seminary received the Phi Alpha Theta/Westerners International Award for Best Dissertation in Western History. Mihesuah’s teaching, research and writing career has been devoted to the empowerment and well-being of indigenous peoples. For the nine years she served as Editor of the American Indian Quarterly, Mihesuah attempted to bring indigenous concerns and voices to the forefront of academic writing. Her own research, writing and speaking focuses on decolonization strategies and she one of the handful of indigenous writers who successfully writes non-fiction and fiction. She regularly speaks nationally and internationally about issues pertaining to empowerment of indigenous peoples; her works are cited and reprinted in hundreds of publications and her books and essays are used in classrooms across the world. 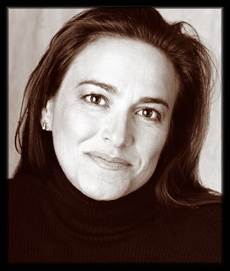 Mihesuah is the recipient of numerous grants, fellowships and awards, from the Ford Foundation, National Endowment for the Humanities, Smithsonian Institution, American Council of Learned Societies, Newberry Library, Arizona Humanities Council, American Historical Association, Oklahoma Writers’ Federation, American Educational Studies Association, Phi Alpha Theta, Westerners International, Arizona Writers’ Association, Gourmand World Cookbook Awards, Wordcraft Circle of Native Writers, Oklahoma Historical Society, Flagstaff Live! And the KU Crystal Eagle American Indian Leadership Award. She was a finalist for the Oklahoma Book Award and the Gustavus Myers Center for the Study of Bigotry and Human Rights Book Award. At Northern Arizona University, she received the Native American Students United Award for Outstanding Faculty, the President's Award for Outstanding Faculty and the Outstanding Faculty Woman of the Year Award.